It seems like you can’t go anywhere without seeing a hashtag from movies, television, restaurants, even your local grocery store – they are everywhere. For those of you who don’t know, a hashtag is a simple keyword phrase that is spelled out with no spaces and a pound sign (#) in front of it. For example, a hashtag we use here at Sesame is #SesameSmile. From a business stand point, hashtags are used to boost brand recognition and use on social media platforms such as Facebook, Instagram and Twitter. 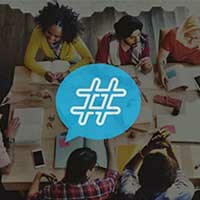 One of the most frequently asked questions our Sesame Social Team gets from our members is “What is a hashtag?” The basic use for a hashtag is to keep topics that are discussed by different users into a single stream. When you use the pound sign (#) a hashtag is activated and becomes hyperlinked. Folks can click on the hashtag and see hundreds of posts that people have shared about the specific hashtagged topic. But Why Should Our Practice Use Hashtags? Creating a hashtag is a great way to keep posts organized. For example, let’s say you are running a contest on Facebook. You want patients to post photos of their brace free smile but you need to find a way to keep track of the entries. We suggest you use an individualized hashtag such as #BracesByDrSesame. When the contest is finished, you can click the hashtag and see everyone that posted a photo using your specific hashtag. This will help make the process of picking your contest winner(s) more efficient. Your patients and your audience will have a lot more fun with a clever and unique hashtag. If you have your patients use the hashtag #TacomaDentist or #OrthodontistSeattle there’s a good chance it will be buried in a pile of other posts from competing practices. We suggest, you incorporate the doctors name in a hashtag, your specific location or your practices tag line. To see if your specific hashtag has been used by someone else you can use websites such as HashTag Generator. This website will show you how many other posts exist with the hashtag you are trying to use. In a social media world, where everything moves incredibly quickly, hashtags have been a constant. Having something that stands out and shows that your practice is creative and fun is paramount. As always, if you have questions about utilizing hashtags for your practice contact the Sesame Social Team.